Home › About › Ambassador Racing Team › Jody G.
10K: 2013 Conquer The Hill: 44:53, 1st overall woman! Full: 2013 Monumental Marathon: 3:27:57, 12th in my division, 530th overall. Tri: Morgan's Triathlon (individual, w/ kayak) Kayak 6mi downstream/run 6mi up/bike 18mi… results lost to time. Favorite Training Method: For me, minimal miles and focused workouts are best for helping me get fitter and faster. I like to run fast-ish long 1x/week, medium-tempo 1x/week, and hills or speedwork 1x/week, with maybe an easy run thrown in there. Other days I'm working on my core/flexibility/strength with focused, intense workouts for total-body fitness. Favorite Training Song: Burn This Disco Down, Michael Jackson, 1979! Say something Jody! 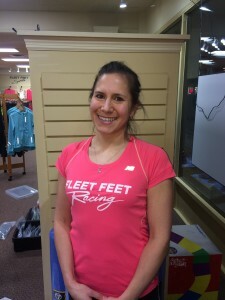 I'm so stoked to run with the Fleet Feet team. In 2003, after a few failed attempts at completing training for the full Pig, I decided to take a chance and run with the Fleet Feet training group. I was worried I'd be too slow or just not fit in. I can't think of a better risk I've taken (maybe besides my marriage, and all:) ). Because with those ties, I've made some of my best friends and learned invaluable knowledge about running, meeting new people, and pushing my limits.